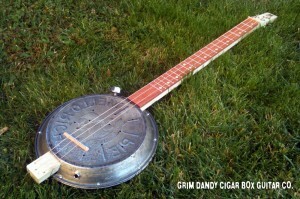 Uncategorized | Grim Dandy Cigar Box Guitar Co.
Made with two antique pie tins, this unique little gitty has a unique tone very similar to a banjo but with a great metallic warble that sounds like nothing I’ve heard before. Whether struming on this clean or with a dirty blue distortion, you are sure to love the growl. In a time of mass produced carbon-copies, over consumption and waste, individualism has become a desire while reuse has become a duty. Crafted in the tradition of the primitive, handmade instruments of the early bluesmen, these one of a kind Cigar Box Guitars harken back to a time when we ate what we grew, we used what we had and we made what we needed. Crafted from the discarded boxes that litter the trash cans of smoke shops across the country, these instruments remind us of a time where music was full of grit and the blues was more than just music but a way of life. © 2014 Grim Dandy Cigar Box Guitar Co.